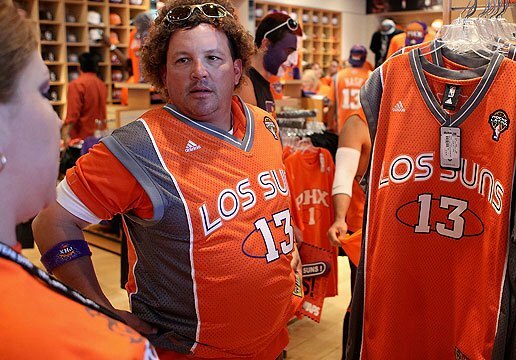 "Does this jersey make my beer belly look fat?" Is there a more boring regular season in any North American professional sport than what the NBA offers up each year? Besides the WNBA? NASCAR doesn’t count–it’s not a sport. OK, maybe the PGA. Out of the Big Three, regular season basketball is at the top of the list when it comes to forcing the sports-loving public into acts of desperation to sate the appetite for unparalleled drama; a drama which can only be fulfilled by watching men battle other men to advance a ball against the opponent’s will–with passion. I must confess–I am a lifelong fan of basketball. Baseball is still my first love (apologies to the missus), but I have always held a soft spot for growing up and cheering for Magic Johnson and the Showtime Lakers battle against Larry Bird and the hated Celtics in the 1980s, and witnessing perhaps the greatest athlete of my generation in Michael Jordan redefine the way the game was played. I particularly enjoyed watching the way these giants played against–and hated–each other. Every time they faced off. Even in the regular season. Fast forward beyond the golden years of the NBA into the present day and you find that the competitive drive to pound the other guy into the hardwood that permeated throughout the league has transformed into a fraternity of collegial millionaires who are more interested in being invited to the hottest parties in Souf Beach [sic] by the very people they claim (and fans hope) they hate–guys from the other team. The result? Fan interest is trending ever southward, particularly mine. Even with my favorite team vying for the cherished three-peat, I still find myself hard-pressed to sit down and take in a regular season game. Why? These games don’t matter. I know it, the players know it, and now–apparently–the league knows it. Half of all teams in the league are guaranteed a spot in the playoffs. Good teams can usually sleepwalk into the post-season, so long as they stay healthy and/or out of jail, and bad teams are simply unwatchable. I’ll tune in once the playoffs begin, but until then, my resolve is very similar to that of the average NBA player–I just don’t give a damn. With apathy levels skyrocketing amongst traditional fan bases, the NBA is reaching out to a new demographic from which they will inevitably siphon as much disposable income as possible–the Hispanic population. Those of us that actually watch the occasional NBA regular season basketball game, or even catch a glimpse of the scarce highlights interspersed between the 90 minute-long advertisement that ESPN’s SportsCenter has become, have probably noticed the campaign to engage Spanish-speaking audiences into falling for the trap that is the NBA regular season. NBA’s Noche Latina — the month-long campaign to rebuild an uninterested fan base. To appeal to the Latino populace, the NBA has extended a welcoming hand by adding a translated “The” in front of many of the teams’ names across the league. The Miami Heat are called “El Heat.” The Chicago Bulls are tastefully titled, “Los Bulls.” The Lakers? The Los Angeles Los Lakers. However, I would implore the NBA to shift gears from being “not turrible” to “excellent.” Rather than taking a half-assed approach by simply inserting a translated grammatical article–“el” and “los” for “the”–I believe the NBA could achieve its goal to expand the fan base by translating the entire team name into Spanish. Many team names would surely be lost in translation. However, for some teams, the transition would be seamless and make perfect sense. After little-to-no research or justification, I present the following team names in an effort to win over Spanish speakers and lull them into a state of carelessness in which the majority of NBA fans find themselves wallowing until well into May. If we are comfortable calling our lawnmowers “bull” in Spanish (toro for those of you living in North Dakota or who never took high school Spanish), we can certainly refer to Da Bulls as Los Toros for a month. They could take it a step further and ask that Carlos Boozer join in the fiesta and go by his Spanish name, Carlos Bebedor. Uno mas cerveza, por favor. You say “knickerbockers,” I say “pantalones.” Now that the catastrophic damage Isiah Thomas inflicted upon this franchise has effectively said “adios,” this name is particularly fitting in that Knicks fans of all ethnic backgrounds can delight in the fact their team is now able to keep their pants secured firmly around their waist after years of being plundered by the good, bad, and ugly throughout the NBA. Concerned that hornitos isn’t really a translation of “hornets?” Neither are the faithful fans in New Orleans. Free shots of tequila are dispensed in The Hive each time Chris “Cristobal” Paul dispenses another assist. Ce-Pe-Tres…Woooo! Actually, this one is somewhat of a plea to the NBA to change the Spanish nomenclature of Miami’s basketball team from El Heat. That name is nearly as lame as the love triangle that exists among DeWayne Wade, Chris Bosh, and LeBron James. Another option would be Las Tres Bolsas de Ducha. A closeup of the handsome new Las Titicacas jersey. Not sure what “lake” means in Spanish? Me either. Why not, then, supplant “Lakers” with the most famous Latin American lake in the world? 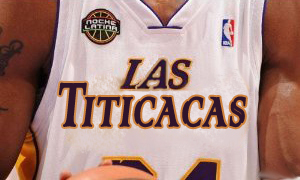 I would actually pony up the cash needed to purchase an authentic purple and gold Las Titicacas jersey if this were to actually transpire. A clipper is presumably the old wooden sea vessels that our country’s forefathers embarked upon to found this great nation. The city of Los Angeles pays homage to these hallowed ships, presumably because there are thousands of them sailing the deep waters of Southern California’s many lakes, as noted by the area’s other, better, NBA franchise. NBA Latino month pays honor to this by tweaking the name to Los Veleros, or sailboats, to better suit the region’s oceanfront attractions. Don’t worry, Clips fans–Donald Sterling will still find a way to keep the sinking traditions alive with or without the Spanish nickname. In English, “Boston Celtics” translates into unfathomable vulgarities. Its Spanish counterpart is somewhat tame in comparison. I won’t bother with the translation. During a time when you hear the word “contraction” being bandied about by owners, players and the commissioner, the NBA needs to pull out all the stops to not only keep fans from turning to hockey, college lacrosse and soap operas as alternative entertainment options. They need to lure a new contingency of consumers who are willing to pay $50 a head to watch millionaire giant-sized freaks of nature put a leather ball through a steel hoop. Until the playoffs start, all we have as NBA fans is the gift of gimmick. In the spirit of mindless American consumerism, I fully embrace this latest fad by David Stern and the balance of his cronies, and henceforth pledge my commitment to indulge in carne asada tacos and ice cold cervezas with a little more gusto as I cheer for Las Titicacas to wrap up a winning regular season. This entry was posted in Sports and tagged basketball, El Heat, Lakers, Los, Los Bulls, NBA, Noche Latina, regular, season by Troy Beckman. Bookmark the permalink. ­¡Ay caramba! ¡Naranjas en la cabeza! No me digas que deveras referieron a los Lakers como Los Angeles Los Lakers. Es la cosa casi más ridículo que he escuchado en mí vida. Aun deben haber contratado los “cabezas-hablantes” de ESPNDeportes para chequear su gramátaica. ¡Joder! Y, por nada de los Bujos de Washington. Que horror. Are you summoning the Great Cornholio? He will know if you are threatening him. I really need a Los Hornitos del Nueva Orleans jersey…can you PLEASE send the shot idea on to the marketing team at the hive!